Rediscovering the Journey: Ninth Station: Jesus falls a third time. Jesus falls for the third time as He gets closer to Calvary and He will take His last breath. The road is getting harder and harder to continue on but He knows how this must end so we may live. His life needs to end so we can live in the next life. There are things in each of our lives that continue to bring us down and take us from where or what we need to be doing. Others around us may yell, mock, or look down on us because we have “fallen” again. Those people are like those who watched Jesus fall again and pushed, beat, and yelled at Him to continue on. This does not help those who have fallen but only helps with keeping them down. It is hard enough to get back up on your own but when those who are around you, do nothing to help but criticize, it becomes even harder to get back up. It is easier to stay down when we fall. Easier to just keep on sinning because “ Why not, I have already sinned anyway”. This idea only keeps that gap that is between us and God from closing. This idea only promotes destruction and does nothing to close or bridge that gap. That bridge or that thing that closes the gap is confession of our sins and admitting to ourselves what causes us to fall. Look sin dead on and challenge yourself to gain control over it. I know I beat myself over some sins over and over because I feel I should have by now a better understanding on how to avoid those things that bring me closer to sin then to God. Once those sins start around me it is easier to fall back to them and allow those sins to multiply. This is where I need to grow and ask those to help and even pray for me in the areas. It is in my weakness that I have to be strong in Jesus as well as each of us do. The strength is in the getting back up each time and continuing on the journey to heaven. Our crosses get heavier when we are at our weakest and lighter when we are at our strongest. It does not mean we have more to deal with always, it can be that we are just tired from the weight of the problems or sins in our lives. 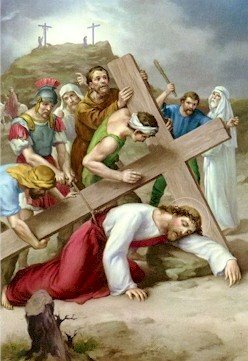 The more we sin the weaker we get and the harder it is to carry our crosses. To get that strength we have to keep sin at a distance so we can stay focussed on the path we want to take. The path that will lead us to the eternal life. Now matter if it is the third time you have fallen or the thirtieth, Jesus is there for you. Remember that. Jesus will be there, is there, and forever will be there. Until tomorrow, God Bless, and may we all continue fighting to stay the course and not fall.